1960 – 1975 – Francesco Toraldo was born in Catanzaro on 9th November to a painter father, Enzo and his mother Elvira. Endowed with a rebel and sensitive nature, but attracted to forbidden and unconventional things, he showed an early interest for painting. When he was three years old often would observe his father in his painting studio, until he could start painting on his first canvas made for him. According to his father and some family friends including many well-known artists such as the painter Mimmo Rotella, Giovanni Marziano, Alfredo Pino, Enrico Benaglia, the talent of Francesco was impressive. The colour and its shades were his main passion, red and blue became his preferred colours. The young artist grew up having low interest in studying but much interest in a wild life, such as gambling houses, bad companies and immoral women on one hand and his love for painting on the other one. During his hours spent in his father ‘s studio, he would transform his hunger for life in pure art, which was becoming ever more different from the standards of perfection previously imposed to him by his father. Indeed he started to paint by following his instinct free from rules and precepts. After graduating from junior high school Francesco started the arts high school of Catanzaro, but after several years tensions between him and his teachers became stronger. Francesco believed that art cannot be taught and that an idea would have been “betrayed” if subjected to rules. So he decided to leave academic studies in order to start as a self-taught. His father gave him theoretical and practical training useful for understand that his talent had to be left free and individual. When Francesco was still 19, searching for his artistic identity with difficulty, he was already a husband and father. When he was 21 he had already two children and his job didn’t’ reflect his passion for art. Painting became a necessity, but he couldn’t express himself, his energy was suffocated by his life full of tumultuous experiences that had left in him an utter bitterness. He was almost 40 and the color like magma of his inner volcano came to life. He exhibited in Genoa, Rome and Lecce. Painting took up most of his time and energy even if he made a living doing another job. 1993 His first solo exhibition, at the Lemonade Gallery in Catania, was a success with critics and the public. Following this he exhibited his paintings at the Chianciano Art Gallery in Chianciano and at the Toscano Palace in Catania. 1995-1997 He continued to exhibit at the Continental Art Gallery in Tirrenia (PI), in Rome with the unconventional Via Margutta Group and at the Cortile Art Gallery in Catania. He was then invited to the Federiciana Academy, after which he went to the Modern Art Academy in Rome and there he was commissioned a painting for the Immaculate Conception Church in Pedara, in the province of Catania. 1998 The Sacred Art Museum of Rivisondoli (L’Aquila) invited him to do a painting for the Art Gallery where some of Noberto’s, Terruso’s, Faccincani’s and Alinari’s works were already on display. He also had the opportunity to exhibit his paintings at the Miyako Center in Tokyo and then at the Cefaly Art Gallery in Catania. 2000 He started his professional partnership with the Calcagno Art Galleries. 2001-2002 He held an exhibition at the Artesia Art Gallery in Catania. He was invited to Geneva’s Europe Art. He also began to participate in Art Fairs starting with the Forlì Contemporary Art Exhibition in Forlì. 2003 He exhibited his paintings abroad in Toulouse (France) at the Alain Daudet Gallery. Then he moved to the Achab Cafè in Catania. Here he met the art dealer Franco Pincelli and they started an artistic collaboration. This was followed by an exhibit at Pescocostanzo (AQ) with Contemporary Art Mediart and he was also present at Padua Art 2003. 2004 He continued with numerous presentations at the Graziart Art Gallery in Bitonto (BA), Parma Art 2004 in Parma, Vitarte in Viterbo, MercArt in Lugano, “ Il Gianicolo “ Art Gallery in Perugia, the Colecchi Palace in Pescocostanzo (AQ), the Imperatori Art Gallery at Porto San Giorgio (AP), Padua Art 2004 and Art Expo 2004 in Bari. 2005 He exhibited at Dora Marano Art Gallery in Cosenza, Fontana Vecchia Cultural Center in Catanzaro, VitArte 2005 in Viterbo and the Verduci Art Gallery in Catanzaro. He was invited to the Serraino Art Gallery in Reggio Calabria and took part in MediArte 2005 in Palermo. He also carried out “Rosso Jazz”, a collection of forty unpublished works, at the invitation of Lucio Fumo, the President of the Pescara Events Planning Company. His paintings became part of the XXXIII° Jazz International Festival in Pescara 2005 first and then of the “Moto Perpetuo” summer programme organized by the Local Administration of Pescocostanzo. After this experience he exhibited in Catania and in Trapani, where his solo exhibition focused on the theme of sails in occasion of the beginning of the Louis Vuitton Cup 2005. Later he took part in the 13th Market Exhibit of Contemporary Art in Brescia and participated in other fairs in Padua, Forlì, Reggio Emilia and Bari. The Town Administration of Mesagne (BR) asked him to set up a solo exhibition in the rooms of the Norman-Swedish Castle. 2006 He moved to Rome and started working with the Alexander & Victor Fine Art Gallery of New Orleans. Then he exhibited his works at the Marano Gallery in Cosenza and in March the Vittoria Colonna Modern and Contemporary Art Museum of Pescara hosted his collection of thirty-nine unpublished paintings. 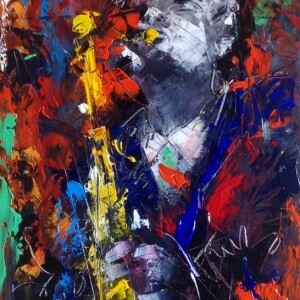 He exhibited at the Meridiana Gallery in Bari too and in June one of his solo exhibitions was held at the ArteCon Gallery in Ascona (Switzerland) during the Jazz Festival of Ascona. In February the PROEL Corporation of Sant’Omero (TE), an international leading company in sounds and musical instruments, asked him to produce a limited graphic edition. The same month the Town Administration of Monte San Giusto (MC) invited him to hold a solo exhibition in the newly renovated rooms of Bonafede Palace. He was then invited on a business trip to Edinburgh followed by another trip to Moscow. 2007 He exhibited at the Imperatori Art Gallery. To celebrate his 30th year anniversary as a painter a solo exhibition was organized by Mediart and the Verduci Art Gallery in Catanzaro, his birthplace. In July the Organizing Committee and the Town Administration of Ancona Jazz invited him to hold a solo exhibition in the rooms of the Mole Vanvitelliana on the occasion of the XXIX° edition of the Ancona Jazz Summer Festival. In the summer of this year he exhibited his works in a group exhibit at the Kursaal in Giulianova. In November Mediart Contemporanea inaugurated its new gallery in Turin with his solo exhibition “Impronte Mediterranee” which was then moved to Mediart in Pescara. 2008 New sports themes such as basketball, skiing, tennis and surfing enriched Toraldo’s paintings and these were just the themes which interested the Organizing Committee of the “Giochi del Mediterraneo” that were held in Pescara in 2009. As a result he was asked to prepare a collection of paintings representing the various sports activities which were held in occasion of the games and, for this reason, Pescara celebrated the collaboration with Toraldo and his decision to live in the city with his family. In April his wife, the actress Nadia Rinaldi, gave birth to their daughter Francesca Romana. 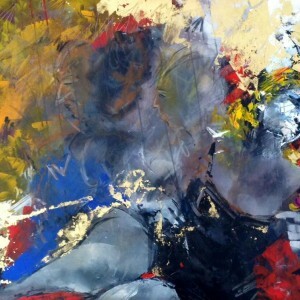 In May the Marano Art Gallery inaugurated its new gallery in Crotone with his solo exhibition. In August of that year the Agatirio Gallery in Capo D’Orlando held his solo exhibition made up of twenty-five unseen paintings which illustrated sports themes. Once again in Sicily, this time in Palermo, the Regional Government reserved the rooms at the Asmundo Palace for his solo exhibition in October. In December the “La Rufa” Art Academy in Rome hosted his solo exhibition entitled “Toraldo e i grandi della musica italiana tra informale e figurazione”, which was born out of a collaboration with the song writer Amedeo Minghi. 2009 He began collaborating with Cesare Corbara. In March the MAS Art Museum (Museo d’Arte Dello Splendore) in Giulianova purchased two of his paintings: one was put on display in the Sacred Art section, while the other one was exhibited in the Contemporary Art section. In June his paintings were shown at the Piazza Grande Art Gallery in Manfredonia and, in the same month, the Manthonè Art Gallery in Pescara organized a collection of thirty of Toraldo’s unseen paintings entitled “I giochi, il dinamismo, l’energia della vita” simultaneously with the XVI° edition of the Mediterranean Games taking place in Pescara. In July he was invited by the President of (Contemporary Art Museum – Acri) Pescara Events Planning Company, Lucio Fumo, to present a collection of paintings in conjunction with the 37th edition of the Jazz Festival held in Pescara. Following this he was at the ArteMax Art Gallery in Naples. In October there were two events: the first was in Conigliano Calabro (CS) at the new branch of the Marano Gallery and the second was in Scafati (NA) at the Barbato Gallery where his solo exhibition, made up of twenty-five unseen paintings, was inaugurated. 2010 In March, at the Academy of Fine Arts in Foggia, a student who was about to graduate, Sara Magliano, centered her graduating thesis entitled “Tecniche e tecnologie del disegno”- Vibrazioni e sensazioni dell’anima – on Francesco Toraldo. During the same month he held a solo exhibition at the Idearte Gallery in Potenza. Cesare Corbara, with whom he had already collaborated for some years, organized other solo exhibitions. He then held a solo exhibition entitled “Blue Jazz” at Capua, upon invitation of Giovanni Vinciguerra, the Mayor and the Art Director of the Contemporary Museum. This exhibition was visited by the artist Bruno Donzelli and the Minister Mario Gandolfi. Three solo exhibitions followed at S. Maria in Vico, at the Baccaro Gallery (Pagani) and at Gigi Verduci’s Del Corso Gallery in Catanzaro. During his stay in Rome he met Sergio Valente, who was the best known hair stylist in the world and who invited the painter to take part in “Art in the Easter Egg”, a prestigious charity event. It was created by the hair stylist in 2002 and its aim was to connect art, territory and medical research through a message of solidarity, with the participation of painters, sculptors and designers creating works inspired by “the egg” as a symbol of birth and hope. In December he participated in the 4th edition of the BANCARTIS Project in Calabria, at the De Cadorna Hall in the business district of BCC Mediocrati in Rende, where Toraldo’s oil painting “Buster Williams” was presented. This painting was an anticipation of the exhibit that the MACA (Contemporary Art Museum – Acri) would have dedicated to the artist in March 2011. 2011 The artist’s solo exhibition was inaugurated at the MACA (Contemporary Art Museum-Acri), followed by those in Francavilla Fontana, in Ancona and still in Calabria at Montalto Uffugo and in Salerno at the MixArte Gallery. The artist’s social obligation continued thanks to the meetings with Eugenio Farina and Fabio Contato, owner of the Provenza winery. The painter was invited by these two gentlemen to reach Montecarlo and meet Francien Giraudi, the chairwoman of the “Les Enfants de Frankie”, an organization which was the first European Embassy dealing with the precarious conditions of children. These encounters led to the desire to create something new which was the “Lugana” wine for children; part of the proceeds were donated to the “Les Enfants de Frankie” Association. The label on the bottle was drawn and reproduced from a work the artist created for this purpose. Furthermore, 15 labels, earmarked to the production of 15 matusalem (6 litres), were painted on handmade paper, like the one used in the 1700s by the Gardesan masters of paper. The works were numbered and signed by Toraldo and Fabio Contato: the theme was “Frankie” the clown, symbol of the association. The first bottle is found in the showroom of the Provenza winery; number 2/15 was donated to His Royal Highness Prince Albert II of Monaco, who placed the foundation under His High Tutelage; bottle number 3/15 is at the “Les Enfants de Frankie” headquarters; bottles 4/15 and 5/15 were auctioned off in December during the Gala Evening which was held in the Empire Hall of the Hotel de Paris in Montecarlo. On this same evening Toraldo seemed to have been given a white canvas for a new creation which was entrusted to Sotheby’s in Paris and sold for 12.000,00 euros. The sum was given to the foundation. 2012-2016 Toraldo exhibited his paintings at the Chiaia Gallery in occasion of the America’s Cup in Naples. This was followed by a solo exhibition at the Civic Museum in Altomonte first and then at the Fisarmonica Museum in Castelfidardo. The artist worked once again in collaboration with Provenza Winery, created a second label on theme “Frankie” and a part of the earnings were given to the “Les Enfants de Frankie” Association. In July once again the artist inaugurated a solo exhibition at the Dominican Convent in Altomonte in Calabria. In August he moved to Sicily for personal reasons. He accepted to participate in two Art Fairs in Piacenza and Cremona, followed by an exhibit at the Calcagno Gallery in Catania. The Museum of Sacred Art in Rivisondoli (Aquila) purchased another work and organized a solo exhibition in September. He was invited to a further solo exhibition by the Town Administration of Licata at the “Re Grillo” Theatre in occasion of the inauguration of the “Rosa Balistreri” music school. Although he was having difficulties in his personal life, he was able to draw inspiration from it and this was very much reflected in his works. He was inspired by this personal darkness to create colourful paintings, but it was above all his companion and muse Rosanna who inspired him in a positive way. These new feelings came out in his paintings, now rich with new light. He then made the decision to live in Agrigento that he considered to be a unique place for its history and culture. Motivated by renewed enthusiasm, Toraldo began many interesting artistic experiments. After a long time he started painting again on paper claiming: “When painting on paper my language is not rhetorical and the sign does not take any rational principle into account”. This new environment originated new partnerships that put him in national spotlight, participating in 2016 in several exhibitions such as in Cremona, Palermo on the occasion of “Passions in movement” at the Raffaello and Salerno art gallery with “The life of colorei” at Palazzo Genovese. He was invited to exhibit in Venice for a collective art show in collaboration with Mazzoleni Foundation.